The Economics major, previously offered by the Busch School of Business and Economics, will move under the School of Arts and Sciences in the fall of 2018, according to an email sent Thursday, February 1st to current Economics students from Professor Martha Cruz-Zuniga, Director of Economics programs. The move had been discussed and anticipated among students for some time, and professors of the department held a question and answer session on Wednesday to address speculation about transferring the Economics major. The announcement had not yet been made final at the time of the meeting, though the professors spoke candidly about how the imminent switch will affect students and faculty members. This change is being mandated by the university mainly due to a difference in definitions of research, and a contrast in the school’s vision. There has been significant talk among students in classrooms and amongst peers about the circumstances of the change in schools. Professor Cruz explained that current standing freshmen through juniors will be able to choose whether their diplomas would include The Busch School or the School of Arts and Sciences. In an email to only Economics students, Cruz addressed concerns about the status of classes and the degree. “There will be no changes in the B.A. in Economics, B.S. in Economics, and in the B.S. in International Economics and Finance-Honors, which will all continue to operate as they are under the Economics area,” Cruz wrote to students. The Wednesday meeting, held in McMahon Hall, focused on looking ahead to the reality of becoming an Arts and Sciences major. Economics students asked Professors Maria Sophia Aguirre, Kevin Forbes, Richard Gallenstein, and Cruz questions regarding their degrees, curriculum, and the future of the changing program. Under the change, the Busch School of Business and Economics will remove Economics from the title. “All senior students graduating this semester will see the current school name, School of Business and Economics printed in their diplomas,” Cruz said. The professors, in answering students’ questions, said a degree from the School of Arts and Sciences would potentially carry more weight than from the business school. The move will likely affect the Busch School’s quest to gain accreditation as a business school. The business school, now just five years old, has yet to gain its accreditation, which sets the university back compared to other reputable schools in the United States. Other top D.C. schools have accredited business schools that are separate from their respective economics programs. One professor from the Busch School said that this separation is common due to the fact that the subject is very researched-based and considered more of a science. Dr. Forbes commented on the length of the accreditation process, which generally takes about 14 years, as he expressed deep disappointment with the school’s lack of seriousness and urgency in regards to the desire to become accredited. Forbes said that he was initially delighted when the department moved to the business school in hopes that it would speed the process, but, as Dr. Aguirre also noted, the current move will likely set the business school back on its mission and the 14-year timeline would be optimistic. 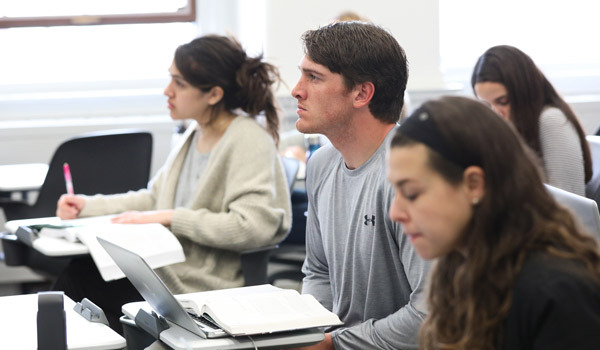 The process for accreditation heavily emphasizes the importance of research for a university’s business program, causing some students to think that the Busch School would suffer from losing a very research-based major in economics. Carly Baluarte, a junior Economics major, expressed her concerns for the business school and its reputation considering accreditation. The professors at the question and answer session noted that studies show today’s prospective students look for schools that can offer them abundant opportunities for research experience inside and outside of the classroom. Professors at the meeting pointed out that this change will not make the degree easier to earn. According to the professors, if anything, the program will be more difficult but, in turn, more beneficial for the professional future of the students and for the school. One potential benefit from the economics major moving to Arts and Sciences is an independent budget. Professors expressed excitement in the chance to allocate more money towards research projects, including the revival of a fellowship program which lets students work under professors to gain professional experience, all while receiving a stipend. This fellowship program was recently cut, due to a lack of funding. Samantha Coviello, a junior International Economics and Finance major, discussed her concerns with separating economics from business given that her degree overlaps with both schools. She also expressed the frustration that is felt within the department due to a shortage of funding. “I think a lot of the Economics professors want to expand their research, and with the funding they have right now, they can’t,” Coviello said. Coviello explained that the other departments in the school previously did not take economics seriously, claiming that their research was mainly “theoretical”. The general reaction from faculty and students is positive because they believe there is more room for growth in the School of Arts and Sciences. Leanne Robinson, a current Economics student, shared her positive thoughts about the move. Professor Cruz encouraged everyone to look at the positives of the situation and, although the Economics Department was not looking for this shift in the school, the faculty is welcoming the change with the possibility to do more good things for students with their new independence. Senior Kevin Ross contributed to this reporting.